Today the lovely Debz over at The (Not so) Secret Diary of a Wannabe Princess has declared a whole day of PS blogger love. I very nearly missed out on this as I didn't set myself a reminder to send her an email...ooopps! Luckily Debz emailed a few days later with all the info about the day! Over the past few weeks there has been a few ups and down in the PS blogging world. I'm not a lover of negativity so I try not to let it get to me, I'm a firm believer in if you are doing something that you enjoy, carry on! As long as you are not hurting people, doing something illegal or dangerous then do what pleases you, life is short, enjoy it before you get six under. There will be people who love you and those who love to hate to you, as Jay-Z said ''either love me or leave me alone'' ok, so I'm not saying that you have to tell every blogger/person you love them but a little love goes a long way, right?! So my first memory of Lucia is back in 2013, I had seen a tweet about a plussize event in London, wondering what it was I sent an email and received one back to say it was the launch of Pink Clove. A few days later Mr C and I set off to London. To say I was nervous is the understatement of the year, I thought my heart was going beat out of my chest. Anyway, the first people I saw were Debz, Lucia and Leighanne so I hung around outside until I saw them go inside and then I scuttled in afterwards! This is one of my favourite outfit posts from Lucia. 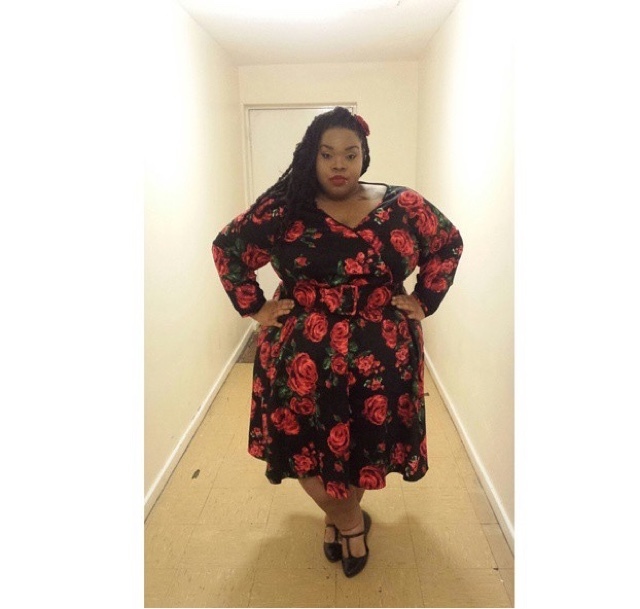 If you haven't seen this photo yet go and check out Lucia's blog, how amazing does she look in this dress!! The dress, make-up and hair....perfect! Don't forget to check out the #PSBloggerLove today on Twitter and share the love! <3 the rose dress. She looks beautiful and the colors combination of red rose and black midnight works. What would be more perfect than to receive a bundle of roses from a loved one!